Brainstorm Print offers the full gamut of apparel whether its corporate logo wear for your customers or employees, or an event driven article of clothing, or team garb. 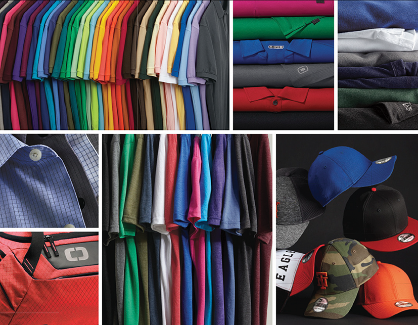 We have it all - from screened to embroidered - shirts, jackets, jerseys, dry fit, hats, the whole spectrum of what you are looking for. Let us support your next event with just the right article of clothing and your logo. If you want to shop for garments before we decorate them – it’s easy to browse the offerings from some of our major suppliers. Click on a link and go shopping. Once you find the garment you like, tell us the model number and quantities and we can price the decorated garment for you.